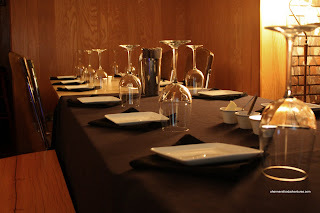 As we (Kim & Anita) arrived at the location, we were ushered outside to the deck since it was such a nice day. There, we met up with Victoria, Joyce, Frank and Jonathan. Mijune, Jenny & Ricky and Ben & Suanne arrived later. 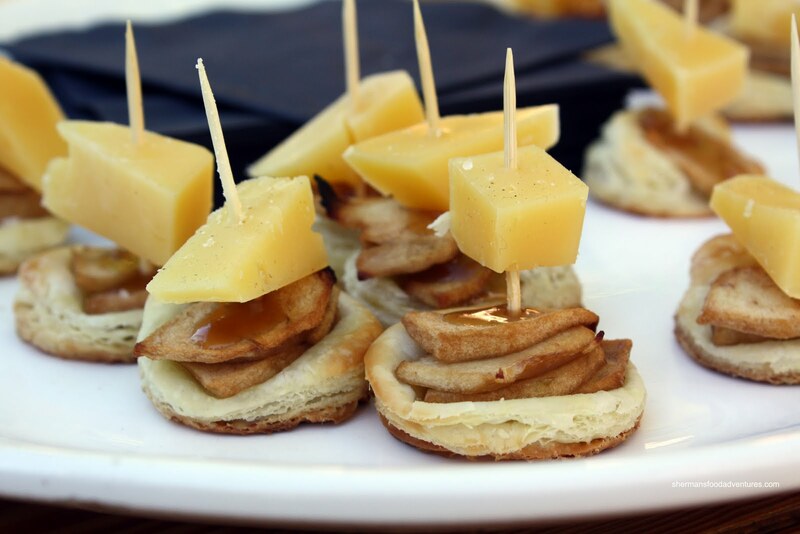 We were served an amuse bouche consisting of Farmhouse BC Gruyere & Sour Apple Tart on handmade puff pastry with apple reduction. At first, I thought the large piece of gruyere might have been too much for the other ingredients; but it turned out to be well balanced. A good mix of sweet, tart, savory and nuttiness. After that, we were ushered to the basement or the "dining room". Walls adorned with wine welcomed us to a cozy, if not "That 70's Show" decor with a table consisting of 2 separate sections and a mish-mash of chairs. Hey, that really didn't matter to me since it's the food that counts! 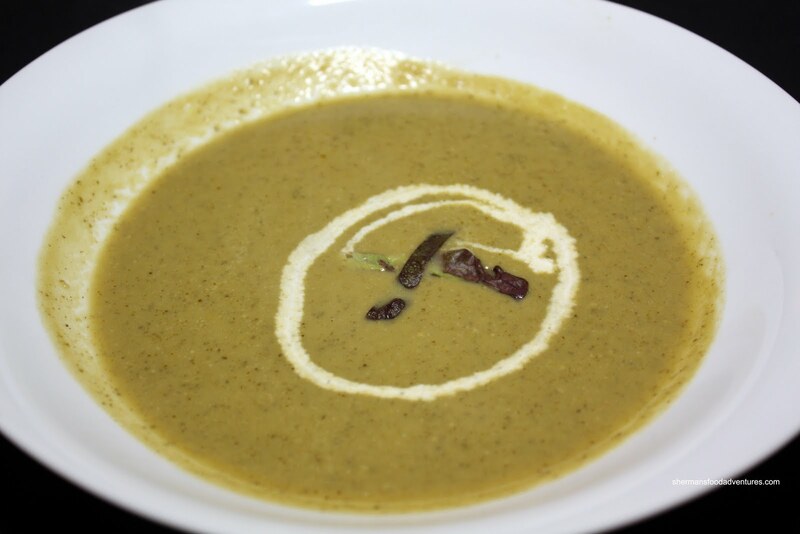 We started with the Stinging Nettle Soup with arugula, sweet peas and garden rosemary finished with a radicchio cream garnish. Served on the side were BC stout bread cubes. Having a consistency similar to pea soup with spinach, I enjoyed the smoothness. Flavours were subtle with a hint of bitterness from the radicchio. My only wish would be that the soup be hotter. 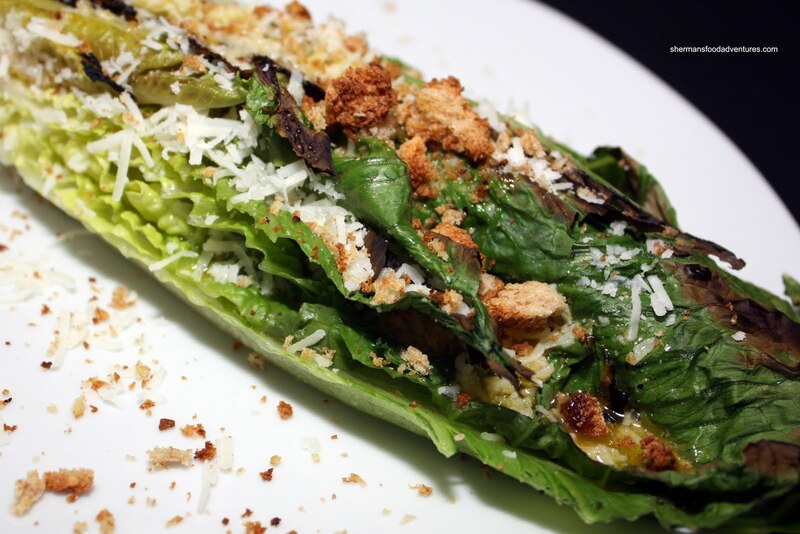 Next up was the Cedar Smoked Romaine with pecorino/parmesan, portugese olive oil vinaigrette and garlic croutons. A bit similar to the Caesar at the Sandbar, the romaine heart is served as is. The smoky cedar flavour was really apparent while the romaine retained all of its crunch. Combined with the vinaigrette and the cheeses, this resembled a Caesar; yet by virtue of a lighter dressing, it allowed the smoked flavour to shine. 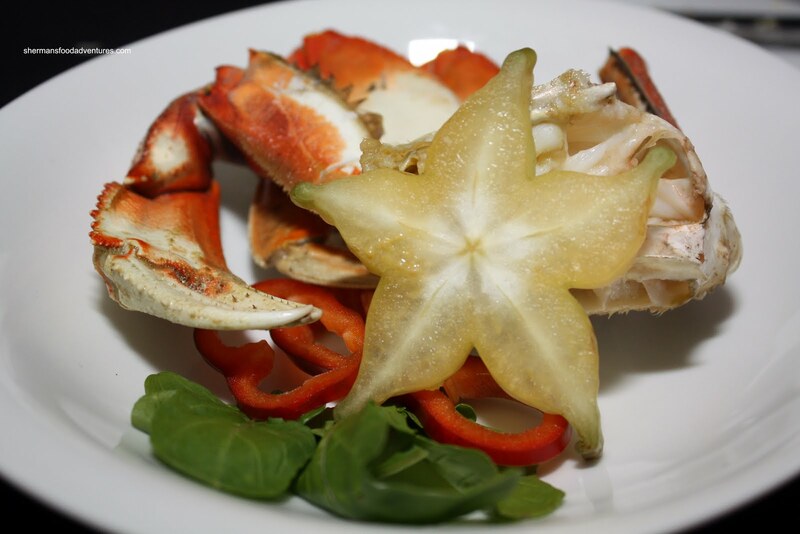 Following the salad was the Baked Live Dungeness Crab with Averill Creek BC Pinot Gris, with red pepper and star fruit. Garlic and crab butter was served on the side. For me, the natural sweet and saltiness of dungeness crab combined with plenty of garlic and a perfect amount of wine made for a tasty eat. Translation: the baked crab was in its natural state (baking retains more of the flavour rather than boiling or steaming). Adding the crab butter only further enhanced the already flavourful dish. 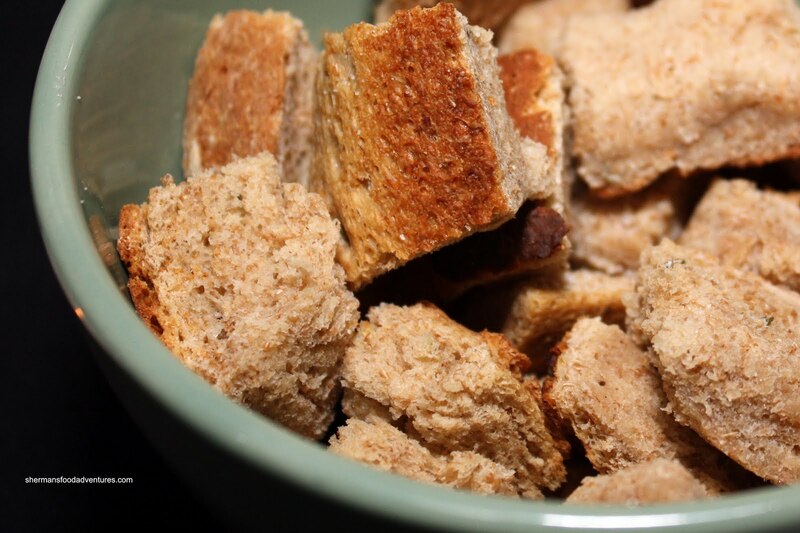 We actually used the remaining croutons to soak it up. I only wished that my portion of crab was cooked a little less since the body meat was slightly overdone. 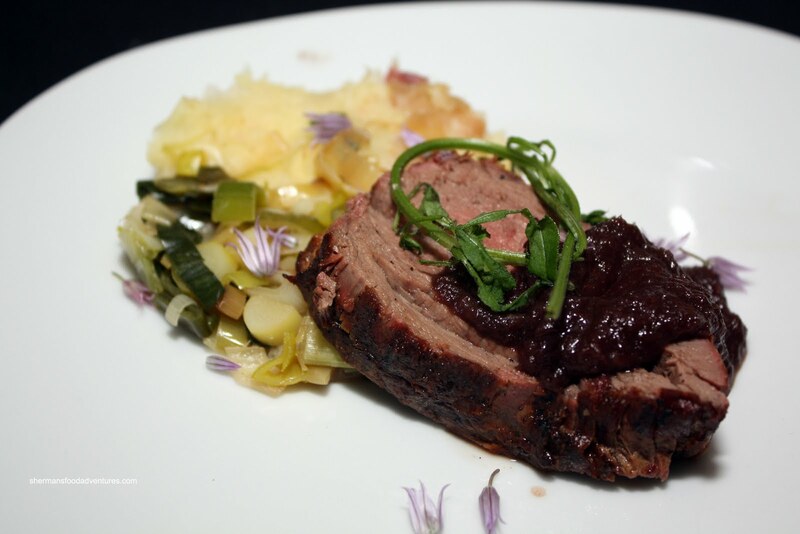 Our meat dish consisted of BC Bison Tenderloin with red onion jam (braised in noble ridge meritage), creamed parsnips with garden rhubbarb, sauteed leeks with cattails in BC chardonnay, cleavers and chive flowers. We thought that the tender bison was masterfully grilled with a nice charred exterior. I was not a big fan of the jam since it was quite sweet and detracted from the natural bison flavour. The creamed parsnips were nice but for me, there were too many ingredients accompanying it. 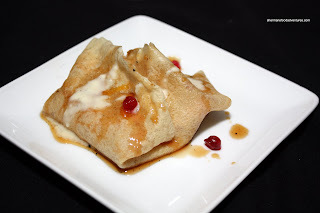 For our dessert, we had the Beer Battered Crepe Blintz with (Limbert Mountain Farm) cream, Earl Grey tea creme anglais, apples & huckleberries and Amontillado Sherry reduction (consisting of pepper, lemon rind, vanilla bean). Under the dark lighting, I didn't even realize it was a blintz. There wasn't anything inherently wrong with the dessert; but for some reason or another, something seemed to be missing. The blintz was slightly crispy and the cream was certainly creamy. There was a understated tart and sweetness as well. Maybe it was too light of a dessert? 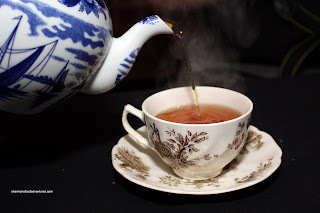 Lastly, we were served Limbert Mountain Farm double cream with Earl Grey tea. I'm not much of a tea connoisseur; but combined with the rich cream, I enjoyed the hot beverage. It was a nice end to a relatively good meal. It started off quite strong and weakened slightly after that. For $49.00, I thought it was a good value despite the fact I was craving a Filet-O-Fish afterwards (if you don't get this reference, click on the link). If I had to make a comparison, I found the NFA dinner more filling with slightly better ambiance. With that being said, I still think it's definitely worth checking out. I just came over from reading Kim's review on Swallow Tail, was fun to compare and contrast! At first I was thinking $49 sounded like a pretty good deal for a 5 course meal using local BC ingredients, but not if you were craving a 'filet-o-fish' afterwards! Interesting that you mention BK. I don't recall the last time I have been to one, though, of course, the presence of BKs is not that noticeable here compared to even Wendy's! Yah, Kim and I do disagree. However, in this case, I think the main point we agree on. It's not bad, but nothing pressing to return to. Yes, I was hungry after! "Yah, Kim and I do disagree." So you wanted a Filet-O-Fish but he wanted a Quarter Pounder ? LOL. LT, no, Sherman wanted a quarter pounder and I wanted a Royal Cheese. LR, we were thinking of getting that crazy concoction of all the meats from McD's into one burger... Heart attack!